Being born isn’t an easy process (it’s called ‘labour’ for a reason! ), but our bodies have some really clever tricks up their sleeves to help make it all easier. It’s all about the hormones! More accurately, one of the most important players is the hormone Oxytocin. The Oxytocin system is triggered during normal childbirth and breastfeeding, and through skin-to-skin and close physical contact. Oxytocin has a wonderful calming effect on the brain; both parent and child will feel safer and more relaxed, blood pressure and other physiological stress-responses fall. The body and mind of both you and your baby learn to associate these positive feelings with being close to each other; the biological basis of this most fundamental and important relationship[i][ii]. The positive effects of Oxytocin in your body are both wide-reaching (from regulating your baby’s temperature to facilitating a successful breastfeeding relationship and reducing any symptoms of post-natal depression) and long-term (from helping with the formation of healthy relationships to life-long protective health benefits for breastfeeding mothers). The way to tap into this biological miracle cure is simply to have skin-to-skin contact with your baby for a few hours a day[iii]. 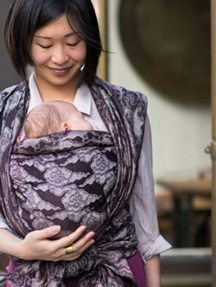 Babywearing is an obvious way to help facilitate prolonged skin-to-skin contact during the first months[iv][v]; using a soft wrap or sling is a very popular way to keep your baby close whilst allowing you to be mobile and hands-free to do other things, if you want to! Many people set out wanting to find ‘the best’ carrier or sling for their family. They may even have found one that suits their immediate needs perfectly, but then things change. A baby’s normal growth trajectory has it doubling in size in the first 6 months, tripling in size in a year[i], all whilst acquiring an enormous list of new physical and cognitive abilities too! So what works ‘best’ now will almost certainly not be ‘best’ at all stages and in all situations. Here’s a run-down of the main stages of baby development and how this may affect your child’s carrying needs and preferences. Most newborn babies love experiencing a feeling of safe containment that mimics the experience of being in the womb, and that Oxytocin-inducing skin-to-skin contact is hugely important during this time. Your baby will have minimal strength and control over their body and so will need full support for their head and spine. Position them facing you (chest to chest), with their face visible and head high on the flat part of your chest ‘close enough to kiss’. Upright positioning is often easiest to get feeling safe and supportive. Being held safely upright on your chest helps soothe symptoms of reflux or colic, and is a safer place for daytime naps than lying flat in a room on their own[i]. There are many slings and carriers suitable for use from newborn; some will be optimised for this stage and therefore have a more limited longevity; others may last longer, but require adaptions or inserts in order to be suitable for a newborn, which may be less convenient to use. A soft stretchy wrap or sling may feel most natural as a way to facilitate skin-to skin contact. Whatever you are using to carry your newborn, take extra care to monitor your baby at all times whilst in the sling, wrap or carrier. The following T.I.C.K.S. safety guidelines are a great checklist which use can use to check for safe, supportive, comfortable positioning in any sling or carrier[ii]. Wow! What a busy phase for development this is! We’re going to place more focus here as this stage can be a challenge for everyone involved. If the first months are for nurturing strong internal organs for independent breathing and digestion, these next months really put your baby’s new internal powerhouse to work. Your baby’s brain is putting out all sorts of connections; the left and right sides of their brain are starting to talk to each other and they can now see for longer distances so there really is a whole new world both inside and out for them to experience and assimilate. Their spinal muscles are strengthening and they’re starting to be able to control and coordinate their movements. You notice them practicing these new muscle movements; first by constantly turning their head and looking at everything (working muscles needed for secure head control and to calibrate depth perception), then by turning, pushing or twisting as the spine strength develops further down their spine to their shoulders and upper torso (practicing reaching and rolling, and hand-eye coordination). Many parents notice their baby’s behaviour change dramatically; your baby may well be expressing themselves more loudly and demonstrating frustration; they can sense their own potential, but still don’t quite have the ability to act on it. This is all very commonly expressed by reactions to how they are being carried, and many parents find that this stage feels surprisingly challenging. Whilst your newborn may well have loved snuggling in their cosy wrap; your 3-6 month old will be letting you know that their needs have changed. It may seem like ‘they don’t like the sling’; they may push against your chest or against the carrier itself; they may twist and crane their neck and they may make bigger stretching movements with their whole body. 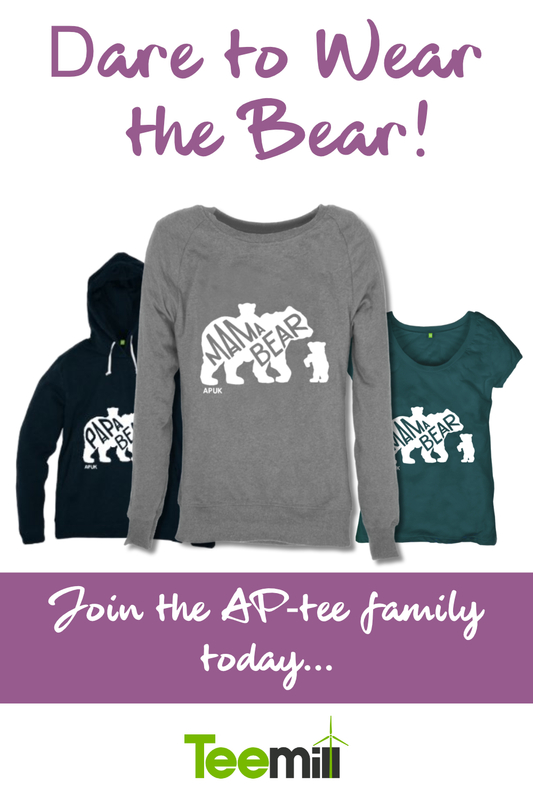 Don’t give up on carrying – your baby needs you more than ever! They may well be feeling frustrated, but not necessarily with you or with your sling. Carrying at this stage gives your baby fantastic opportunities to strengthen the muscles developing in their neck, back and core; it’ll give them a great vantage point to start engaging with the world, and it will allow them a vital safe resting place where they can absorb and process all that new information. At this stage make sure that your baby’s lower legs are free to move when they are in a sling or carrier. Once they are able to stabilise their head against the movements of your body they no longer need support up to the top of their spine; up to the top of their shoulders will be sufficient. Make sure your baby has access to their hands; they’ll find this reassuring and start to coordinate hand-to-mouth movements in preparation for eating solids. You may find that they want an arm or two completely free to move; they may be strong enough to manage this, but be aware of how well your baby can support their upper body. They may still need head support, especially when sleeping, even if while awake they want to feel their face and arms being less contained. Are Outwards Facing Carrying Positions Safe? A specific babywearing need that may be expressed by parents or babies around the 3-6 month stage is to be able to carry a baby facing away from their parent. Whilst most babies will express movements described above and be very content facing their parent at this stage, a minority of babies may at times show a preference for outwards facing carry positions. A phase of preferring to face outwards usually coincides with a baby having improved distance vision and awareness of their surroundings but a lack of upper back and neck control needed to engage fully with their environment. This phase usually passes once the baby is able to express themselves more effectively, and/or the next physical milestone (usually rolling or sitting unaided) has been reached. Some parents and professionals express concern about the safety and/or suitability of outwards facing carrying positions. Experts recommend [ref] that for optimal hip stability, a carrier should support a baby’s thighs with the knees held higher than the hips and only the lower legs hanging down (the ‘M’ position). This is especially important during the first 6 months of development and for children with a family history of hip dysplasia or similar problems. It’s also the naturally most comfortable position that a healthy baby will normally adopt when they are being carried upright in their parent’s arms, and aids optimum positioning of the pelvis and spine. Outwards facing carrying positions in many carriers will not support a baby’s thighs to the level recommended and will allow their weight to hang down and away from the parent’s centre of gravity. You’ll notice this hanging weight sitting more heavily on your shoulders, with this effect often exaggerated in carriers without additional lumbar supports. Babies best fit against their parents when facing towards the parent’s body, which will also make longer periods of carrying more comfortable. Long periods in an outwards facing position can be overwhelming or overstimulating for some babies as they cannot can see their parent and turn away from strange situations if they are not comfortable. An inwards facing position on the front, back or hip allows baby to more easily sleep with their head supported. 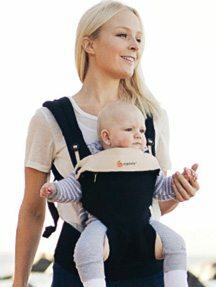 If you’d really like to try an outwards facing carry position, then be reassured that the limited research currently available suggest that short periods of outwards facing carrying using an appropriate carrier is unlikely to cause your baby actual physical harm (unless there is a genetic predisposition to hip dysplasia). To maximise your comfort when carrying in this position, try it using a carrier that has a separately fastening waist – to give sufficient lumbar support for you – and that supports your baby’s thighs so that their legs are not dangling. Do ensure that your baby is able to fully support their own head comfortably – this varies from baby to baby but is usually by about 3-5 months. Don’t use these positions with heavier babies or for longer periods of carrying and do change to an inwards facing position if baby needs to sleep or seems at all unsettled or uncomfortable. Ok, you’ve all made it past that frustrating 3-6 month stage and you’re out the other side. This is a very fun and exciting stage for you and your baby. They can (finally, hooray!) have a clear and increasingly predictable impact on the physical and social world around them. If they want something, they can move towards it, pick it up, reliably hold on to it and start experimenting with it. They’ll also be sharing their experiences with you; they’ll ask for things by pointing and vocalising, they’ll show you things they’ve found and done, and they’ll be watching for your expressions and responses. Once your baby can sit – or at least strongly support their torso to the hips – unaided, then they are ready to be carried on your back in a range of suitable wraps and carriers. Back carrying allows your baby to see the world over your shoulder and at your height. It allows for you to support their increasing weight in a different way on your body (though back carrying isn’t always more comfortable, having it as an option can be a nice change). And it can allow you more freedom of movement to get a lot more done. Whilst for some situations and families, back carrying therefore feels like a very natural and practical progression at this stage, it’s not right for everyone. Your baby is still going through a big jump in social awareness and whilst they can point and get your attention when on your back, it’s not as easy for you to see and respond to each other when you can’t be face to face. You may both feel that front or hip carrying feels more appropriate, and that’s ok too. Do what fits the situation you’re in, and what feels safe and comfortable for you both. You may find that the babywearing solution that worked for the first months no longer feels as suitable or comfortable now. However, your baby isn’t yet walking independently for long periods and so biologically you will still need to lift and carry them! 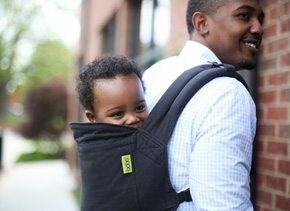 There will be a sling or carrier that will allow you to do this comfortably and safely, though you may need to try a few different options and get some advice to find the right one to suit your family’s needs. It’s also worth knowing that, whilst some people do like the feeling of a well-padded carrier against their shoulders or body; simply adding extra structure or padding to a carrier does not necessarily make it feel more supportive, however heavy your baby. Less structured carriers and wraps mould around you and your baby, offering more custom-fitting and adaptable support which will suit some parents better. Psychological stages: testing boundaries, emotional, social and language development – there’s a lot going on! 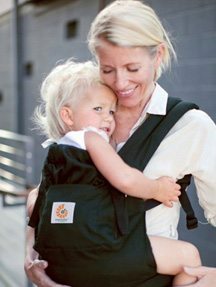 Once your not-so-little one is walking you’ll still find that a sling or carrier can be a parenting essential. They may be able to walk independently, but your child will not have the stamina to go very fast or far, or to get through a whole day without needing a nap. They’ll be going through huge cognitive changes too and will need lots of reassurance to give them the confidence to make the most of their expanding awareness and increasing independence. After a long day walking and learning and socialising sometimes having a big hug is just what you need, and as a parent you’ll find that at this stage your child may want lifting up more than ever! This is also a stage for testing boundaries and you may notice your child refusing to go in a previously-loved sling or carrier. This is very normal (you may notice the same behaviour with a car seat, buggy, high chair, bath, etc.) – they have new independent walking abilities to practice and fascinating new worlds to explore! Even if your child does have ‘sling strike’ phases around the 15-20 month stage, they will often want to go back to being carried once the novelty of walking has worn off and they start getting tired. You may not be carrying your child for as much of the day as you were when they were newborn, but they are much heavier now. 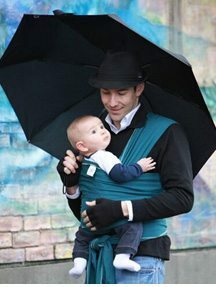 Luckily there are lots of slings and carriers that will help you to carry your growing toddler in a way that’s comfortable and supportive for you both, including toddler-specific carriers that can offer excellent longevity. One that allows you to easily let your child up and down for periods of walking will also be very practical at this stage. From that first rush of oxytocin as your baby is born, help ease yourselves through the transition into your new life together by getting as much skin-to-skin contact as possible. You can do this simply by holding your baby in your arms or relaxing with them on your chest (you’ll be grateful for the rest! ), but you may want to have a sling or carrier ready to use from day 1 to help you to get your hands free. It can be difficult to choose a sling or carrier before your baby arrives; after all you don’t know what their shape, size, abilities or preferences are going to be, and if you’ve got a growing bump then it’s hard to know what might fit your changing body best too. There’s a lot of information to read online, and it can be useful to start to get an idea of the product options available. However, not everything written online is useful and nothing beats your own personal experience. What you think will look easy and comfortable online may turn out to be the wrong for your body or your needs. The best way to really get your head around the options available and to see what might really suit you is to try things out in person. Get advice and try things on! There are lots of ways to get person-to-person help with babywearing and with finding the right product for you. Options include trying products on at Baby Shows, peer-to-peer support at Sling Meets[ii]; more experienced help with trying out different options at Sling Libraries and Hire Services[iii]; and qualified carrying consultants running workshops or private classes[iv]. It’s really worth exploring the support in your area as getting personal advice and hands-on experience saves you wasting time and money on products that turn out to be unsuitable for your family’s changing needs. Plus once you know where to get help, you can always go back to explore different options as your family’s carrying needs grow and change. [i] Moberg, K. U. (2009), The Oxytocin Factor, London: Pinter & Martin Ltd.
[ii] Moberg, K. U. (2013), The Hormone of Closeness, London: Pinter & Martin Ltd.
[iii] Moberg, K. U. (2013), The Hormone of Closeness, London: Pinter & Martin Ltd.